View from a Bus: Whatcha Hiding? I realized that I hadn't posted about the screens I have been working on, or at least I can't find a post where I did. So, I'll get remedial and cover that today. In the later year campers, there is a closet blocking most of the left-rear window (on the driver's side, but all the way to the rear). The driver couldn't see out this window anyway, so it doesn't create a blind spot. I thought it would be neat to create a few screens to put over the window since the only thing a passing motorist would see otherwise is the backside of a closet. 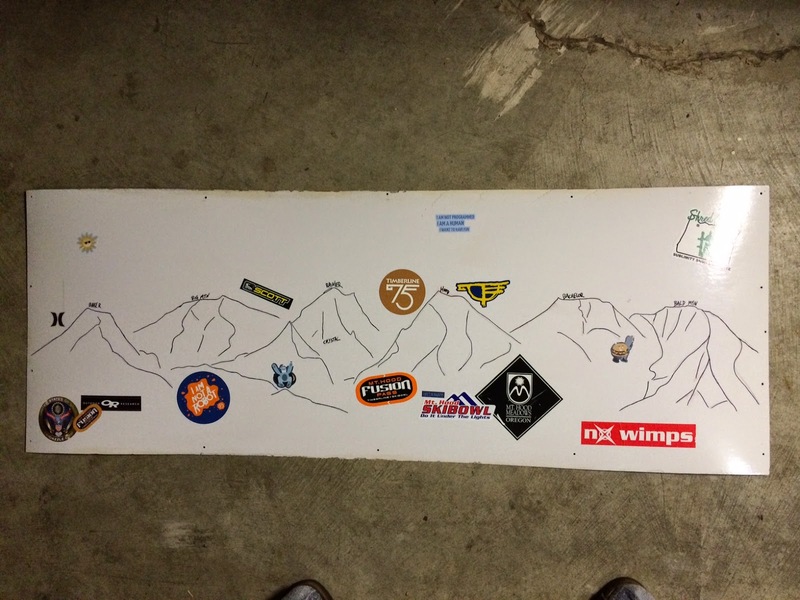 When I built the ski rack (see Rack 'em, Snow Bum), I realized that I needed a screen if for no other reason to hide the equipment. In the interests of spending no money, I went digging through my supplies. I found the ceiling panel from the donor bus from which I got the Riviera Top. It didn't fit my bus, and I didn't need it anyway, so I didn't bother with it. Some careful measuring later, and I had 3 equal-sized screens that each completely blocked the rear window. I set them on top of one another, and drilled mounting holes through so they would all mount the same. Last, I held one against the inside of the window and marked drill holes in the steel. A few minutes with the drill later and I had 3 interchangeable screens. I base coated 2 of the screens with the same bright white that I painted the front bumper (see Front Bumper part 4), thinking I'd use them as a landing zone for themes of stickers. I hadn't really thought about what all of the themes would be, but I figured I'd have at least the one about snow. For that one, I drew mountains based on pictures of various resorts around the Pacific NorthWest (the top picture). Whatever stickers I had, or acquired, for snow would go on that screen. I used the other white one first, just to block out the sun last Fall when I went to Eugene to see Furthur (see A Tale of Two Trips). I just taped a picture and some inspiring words on there as a placeholder. 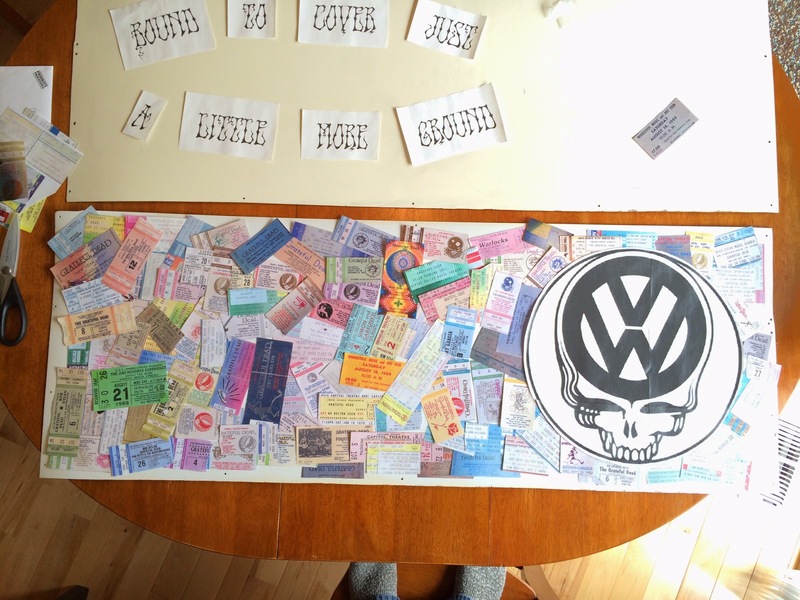 This Saturday, I completed my vision for a screen dedicated to music and music festivals: completely covered with images of ticket stubs plus the VW-your-face that was on the original screen when we went to Furthur. I don't yet have a plan for that last screen. 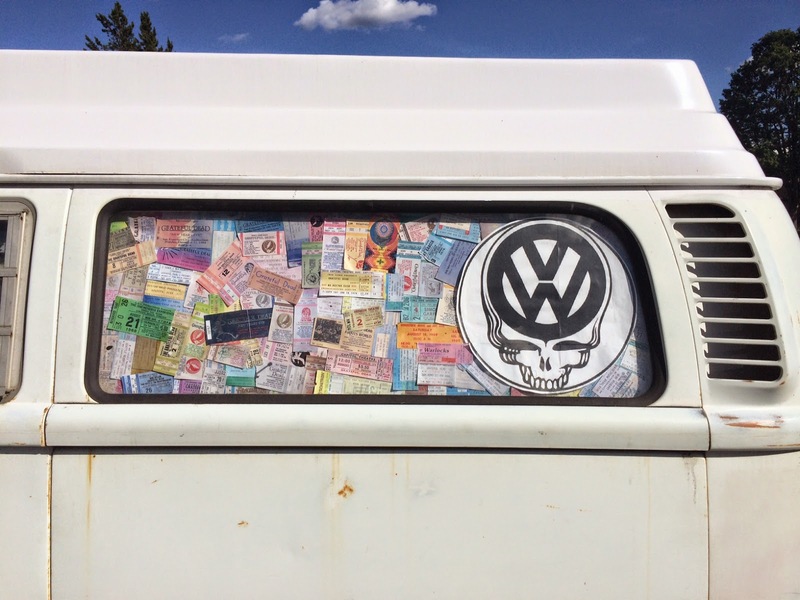 Maybe, I'll use that as a spot for stickers, pictures, etc dedicated to camping, for those trips we take that aren't music-venue focused. installed screen viewed from the outside. That's it for today. I've been driving the bus to work lately. With the mufflers on the pop-top springs (see Spring Sprang Sprung), its conversationally quiet at idle. With the window rebuilt (see Jalousie Window rebuild), its quiet enough to have an "outdoor volume" conversation while driving. Its pretty fantastic.